Religious relativism — the notion that all religions are essentially equal — is an illusion when it comes to progress. Some religions or ethical codes — for example, Protestantism, Judaism and Confucianism — do better than others, in the extreme case, Haitian Voodoo. In the year 1700, viewed from Europe, the Spanish colonies in the south of the New World looked to be much more successful, much more promising, much more affluent than the British colonies in the north. Three hundred years later there’s been an immense flip-flop. […] What you have is Ibero-Catholic culture, which is progress resistant in the sense not only of economics, but also in the sense of social justice and democracy — democratic governance — falling far behind Anglo-Protestant culture in terms of its ability to produce democratic societies. […] In the year 2008, Latin America, which may well have been ahead of the English colonies in the north in the year 1700, is now perhaps 50 or 75 years behind. And while a number of other factors are involved, I believe that the contrast between Ibero-Catholic and Anglo-Protestant culture is a principal explanation. The conclusions that we reached — again, they’re elaborated on in chapter four [of The Central Liberal Truth] — are that generally, Protestants have done better than Catholics. But the Nordic countries are the champions of progress. We could refer to them as Lutheran-agnostics now. That in the vanguard of progress a millennium ago, Islam has fallen far behind and this obviously has contributed to the humiliation that I believe is at one of the roots of jihadism. There are close parallels between Catholics and Orthodox Christians — particularly discomfort with capitalism. I might add that the most recent Catholic miracles — economic miracles — have taken place in countries — Spain, Ireland, the Province of Quebec — that are now referred to often as post-Catholic. Buddhism and Hinduism are not progress prone. 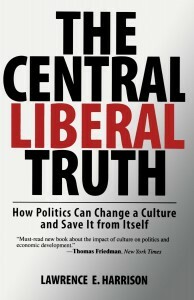 Finally, there is the evidence in this analysis — and the analysis that is contained through the book, “The Central Liberal Truth” that there is a universal progress culture that emphasizes education, merit, achievement, frugality and community. And these are values that are largely shared among Protestants, Jews, Confucians, Sikhs and other groups. Does the religion nurture rationality achievement? Does it promote materials pursuits? Does it focus on this world rather than the next world? Is it pragmatic? In contrast, does it — to those religions that may nurture irrationality — inhibit material pursuits and may focus on the other in a more Utopian way? The view of a religion with respect to destiny, the extent to which a person can influence their own destiny is a very important factor. Time orientation — does the religion focus the eyes of its faithful unto the future or does it keep them in the present or focused on the past? These are the kinds of issues that are very central to the role that religion plays in culture. Interesting stuff. Here’s Part II. Catholicism anti-capitalist? … it’s more complicated than that. impressive job, here on wholereason.com by the way. >> DAVID: Catholicism anti-capitalist? … it’s more complicated than that. Yes, I was generalizing, and North American Christianity is very different from Central and South American, where Liberation Theology (which I believe is anti-capitalist) was popular. RE: Stark, I have favorably reviewed his stuff before, love him! See The biblical origins of science. And thanks for posting and the complement.